In Hillary Clinton's first interview since meeting with FBI officials regarding the investigation into her use of a private email server, she told NBC's Chuck Todd she was "eager" for the meeting, and "pleased to have the opportunity to assist the department in bringing its review to a conclusion." However, she declined to comment on reports that charges will not be filed against her in the case. Clinton also revealed that she first learned of her husband's tarmac meeting with Attorney General Loretta Lynch from "the news." She described it as a "short, chance meeting at an airport tarmac" and that the two "did not discuss the Department of Justice's review." Hillary Clinton, First Lady of the United States, throws a thumbs-up during a presidential election victory celebration in 1992. Her husband might be doing the same for her, 24 years later. Here she is talking to kids at the Children's Memorial Hospital in Chicago, October 21, 1993. As First Lady, she did a lot of traveling, like to Bosnia in 1996 to meet US soldiers. In 1997 she visited Goree Island, Senegal, with her daughter Chelsea. Here they are peering out from the Door of No Return, a former slave trading center, as a soldier stands guard. Nelson Mandela showed Clinton and Chelsea the cell in which he was held for 27 years at the Robben's Island prison off the coast of Cape Town, March 20, 1997. Here she is with Bill in the Oval Office, chatting with a bunch of kids awaiting adoption. Sporting similar power suits and haircuts, Hillary met with Diana, Princess of Wales, at the White House in 1997. No one can claim that she doesn't get her hands dirty. Here's Clinton building a home as a volunteer for Habitat for Humanity in Pikeville, Kentucky, in 1997. She's always been an advocate for affordable health care as well as women's rights. In 1998, Clinton gave a speech at Beijing Medical University about improving health care in China, particularly folic acid deficiencies in pregnant mothers. Like any presidential nominee, she's good with babies. She found this one during a visit to a children's home in the Dominican Republic in 1998. Hillary kneels before the grave of US Private Celia Goldberg, who was killed in Tunisia during World War II, at the North Africa American Cemetery, outside Tunis, in 1999. In 2000, she announced her candidacy for New York's Senate seat. Later that year, Clinton held an event at the White House on preventing potential harm to children from defective products. She won that New York Senate seat on November 7, 2000. Definitely not a "low energy" candidate, based on this picture. Days after 9/11, she took a tour of the World Trade Center disaster site. Here Clinton is giving kids from Manhattan's Colombia Grammar and Prep school a tour of her office on Capitol Hill in 2003. She wrote a book titled "Living History." In 2003, all Clinton could do was smirk on "The Tonight Show with Jay Leno" as Leno shows her a tabloid newspaper article about her hooking up with an alien. A power woman power lunches with US troops in Bagram Airbase, north of Kabul, in 2003. Here she's listening to Defense Secretary nominee Robert Gates testify before the US Senate Armed Services Committee during his confirmation hearing on Capitol Hill in 2006. Hillary and Bill pay their respects to the late former President Gerald Ford in 2007. This is her first presidential campaign's website in 2007. It's pretty low-tech. Back in 2007, she was running against Obama for the Democratic Presidential nomination. Their body language says more than a thousand words. She spent most of 2008 on the campaign trail. She's nothing if not ecstatic. It was a close race, but she had to endorse presumptive Democratic presidential nominee Barack Obama at the National Building Museum in Washington, June 7, 2008. A gracious loser, she waved to delegates at the 2008 Democratic National Convention in Denver, August 26, 2008. Despite losing the nomination, her and Obama found that they had a lot in common. He later made her Secretary of State. Secretary of State Clinton and President Obama tour the Sultan Hassan Mosque in Cairo in 2009. A North Korean soldier looks in through the window as Hillary tours the Demilitarized Zone in Panmunjom, South Korea, in 2010. This is the badass pic that launched a thousand memes. Hillary looks cool as a cucumber checking her phone on a military C-17 plane to Libya in 2011. Here she is in the Situation Room with Obama and Vice President Joe Biden, along with members of the national security team, in 2011. They just received news on the mission against Osama bin Laden. They say the second time's a charm: here is Clinton delivering her "official launch speech" at a campaign kick off rally on Roosevelt Island in New York City, June 13, 2015. Peek-a-boo: Hillary sizes up her audience at a campaign launch party at Carter Hill Orchard in Concord, New Hampshire, on June 15, 2015. Hillary takes the stage to speak during the Scott County Democratic Party's Red, White and Blue Dinner at the Mississippi Valley Fairgrounds in Davenport, Iowa, January 23, 2016. Bill is thrilled as his wife speaks at a campaign stop in Davenport, Iowa, in January 2016. A woman of the people, she hugged Brana Marancic, an employee of Caesar's Palace in Las Vegas, Nevada, in February 2016. They appear to be in a storage closet. Here she is speaking to supporters at her New York presidential primary night rally in Manhattan, April 19, 2016. She did it! Hillary is officially the Democratic presidential nominee, and the first woman in the 240-year history of the US to lead a major party's presidential ticket. Yet she acknowledged that both the former president and attorney general have admitted "they wouldn't do it again." "Hindsight is 20/20," Clinton said. 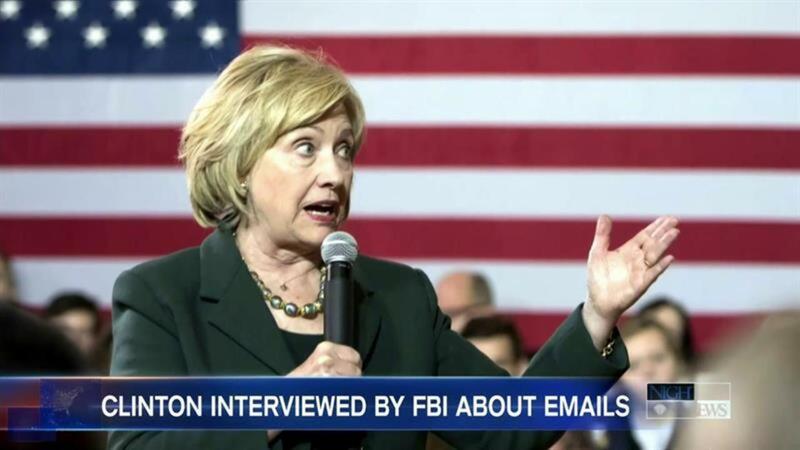 On the email investigation itself, Clinton reiterated what she has said previously, that she "never received nor sent any material that was marked classified." When asked who advised her that it was legal to have a private server, Clinton said that she wouldn't "go into any more detail than I already have in public many times...out of respect for the process the department is conducting." On the political fallout, the latest NBC News/WSJ poll shows Donald Trump leading Clinton 41%-25% on the question of who would be better at "being honest and straightforward." Clinton reacted to those numbers, saying "I'm going to continue to put forth my record, what I have stood for, do everything I can to earn the trust of the voters of our country. I know that's something that I'm going to keep working on, and I think that's, you know, a clear priority for me." "When you've been in the eye of the tornado for as long as I have, I know there's a lot of incoming fire, I accept that," she added. Are Chinese hackers slowing down their cyber attacks on the U.S.?